The History of the Conquest of China by the Tartars. Together with an Account of Several remarkable things, concerning the Religion, Manners, and Customes of both Nations, but especially of the latter. London: W. Godbid, 1671. 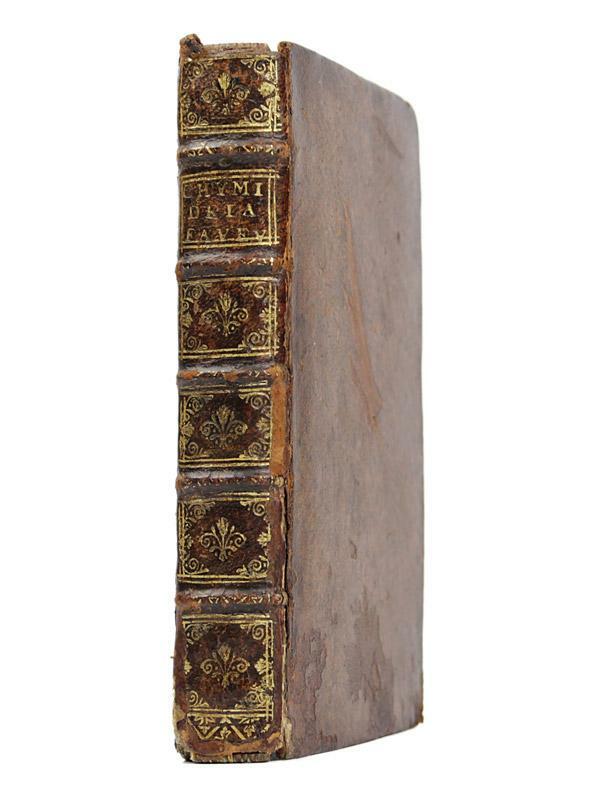 Octavo, with the four page advertisement of the bookseller Moses Pitt at the rear, some of the early pages a little dusted and a few marks throughout; but a very good copy in a recent period-style binding of dark calf, spine decorated and gilt, with russet morocco label. First edition of this important early work on China, now quite rare.The first major news from China to be reported in the Western world was the Manchu conquest of 1644, beginning with Father Martinio Martini's generally accurate De bello tartarico (1654), a work which traced the history of the hostility between the Chinese and the Tartars north of the Great Wall.Palafox y Mendoza, who held bishoprics in both Spain and Mexico, served briefly as the viceroy of New Spain. In addition to his ecclesiastical duties, Palafox was also in charge of the dispatch of vessels to the Philippines during his stay in Mexico. In this capacity he collected "letters and memorials" on events in China as they were forwarded to him, using them to prepare this work, the second European history of the Manchu conquest.He begins his account with the rebellion of Li Tzu-ch'êng and Chang Hsien-Chung in 1640, and provides a good history of the conflict. Moreover, although saddened by the revolt, Palafox does not revert to simply depicting the Manchus as barbarians, arguing that the collapse of the empire was due largely to slow deterioration and neglect. His work is now primarily known for his interest in Chinese government, religion, dress, customs, military techniques and manners (see Donald F. Lach & Edwin J. Van Kley, Asia in the Making of Europe, I, p. 356). Testimonial letter for Michel Bauman, journeyman to the master Imperial gardener Johan Georg Geißner, incipit:] Des hoch und wohll gebohrnen Herrn Herrn Phillibbuß Ludwiguß deß heiligen römll: reichs Erb-Schotz Maister Graff von Sintzendarff .Laxenburg (near Vienna), 1735. Illustrated baroque testimonial letter in black and brown ink on parchment (34 x 60 cm plus a 4.5 cm flap at the foot), with the Sintzendorf coat of arms above centre (12 x 12 cm), illustrations of 4 exotic potted plants, flanking the text, and the text in richly decorated German gothic calligraphy and handwriting. With the crown above the coat of arms highlighted with gold. With slits through the foot to attach the seal, but lacking the seal itself. - For Sintzendorff: ADB XXXIV, pp. 408-412. A testimonial letter for a Hungarian journeyman gardener during his Wanderjahre, from Johan Georg Geißner, master "lust Gartner" at Schloss Laxenburg, outside Vienna, the principal summer residence of the Holy Roman Emperor, Karl VI. Philipp Ludwig Wenzel, Graf von Sinzendorff (1671-1742), was Imperial Erbschatzmeister, which apparently included responsibility for the gardens. Since 1721 he had also been director of the österreichischen Orientalischen Handelskompanie, so he may have had a hand in acquiring some of the garden's exotic plants. The document is folded up and has some minor stains on the back, but is in very good condition, though without the seal that would originally been attached with cords through the slits at the foot. (6), 438 pp., (9) Amsterdam, Jacques le Jeune, 1671, in-12, (6), 438 pp, (9), plein velin, dos lisse avec titre manuscrit, Première édition elzévirienne et la première dans ce format, publiée la même année que l'édition originale parisienne. L'ouvrage fut vanté par Voltaire et André Gide. Il se divise en six entretiens : la mer, la langue française, le secret, le bel esprit, le je ne sais quoi et les devises. Le père Bouhours fut l'ami et le conseiller de Racine, son étude appartient à la plus fine tradition littéraire française, dont la pertinence qui a exercé son influence dans les arts, ne se dément pas aujourd'hui. Le frontispice de Romain de Hooghe, représente Ariste et Eugène, devisant au bord de la mer devant une cité flamande et des vaisseaux. Écriture à l'encre sur le contre plat, note sur la page de titre. Tache d'encre sur la tranche. Antiquitatum et Annalium Trevirensium libri XXV. Lüttich, Hovius 1671 - 2 Bände (in 1). Folio (37 x 24,5 cm). 14 Blatt, 626 Seiten, 14 Blatt, 1 weißes Bl. ; 4 Blatt, 566 Seiten, 25 Blatt, 43 (recte 49) Seiten, 1 weißes Blatt. Mit gestochenem Frontispiz, 13 Textkupfern, davon 2 ganzseitig, 2 Textholzschnitten und 3 Druckermarken. Ohne die drei doppelseitigen Tafeln. Modernes Halbleder mit Rückentitel. Leicht altersfleckig oder schwach gebräunt. Kleine Bibl.-Stempel verso Titel. De Backer/Sommervogel II, 221. NDB II, 639. Älteste und bis heute unübertroffene Gesamtdarstellung der Trierer Geschichte, begonnen von Trierer Jesuit Christoph Brouwer (1559-1617), fortgeführt von Jacob Masen (1606-81). Das Manuskript Brouwers war schon 1591 fertiggestellt, die Veröffentlichung scheiterte aber an Differenzen mit dem Erzbischof Johann von Schönenberg. Schließlich sollte das Buch 1626 in Köln erscheinen, aber auch diesmal war es ein Trierer Erzbischof der es verhinderte. Christoph von Sötern lies wegen seines unseligen Streites mit der Abtei St. Maximin um deren Reichsunmittelbarkeit die bereits gedruckten Bögen beschlagnahmen, später wurden sie als Altpapier verkauft. Lange galt die Auflage als vernichtet, bis man aus geretteten Bögen, handschriftlich ergänzt, eine fast vollständige Ausgabe rekonstruieren konnte. Jakob Masen erweiterte das Werk dann um den Zeitraum 1600-1652. "Eine annalistisch-chronologische, heute noch wertvolle Darstellung der Geschichte des Trierischen Erzstifts." (NDB), "opus immortale" (Hontheim). Die Textkupfer zeigen u.a. eine Ansicht der Barbarathermen, des Erzbischöflichen Palastes, des Amphitheaters, eines Maximiner Sarkophages, einer Hypokaustenheizung, Neumagener Steindenkmäler (u.a. Bibliothek) der Römerbrücke und des Heiligen Rocks. Ca. 12 weitere Seiten mit Münzen. Es fehlen die drei Tafeln: Karte, Porta Nigra, Doppelblatt Igeler Säule, die jedoch als Kopien beigeheftet sind. Erstmals 1670 erschienen, hier im zweiten Druck von 1671. Mit Duplettenstempel der Harvard College Library. Breitrandiges, sehr gutes Arbeitsexemplar dieses wichtigsten Werkes zur Geschichte der Stadt und des Erzstiftes Trier. Falls Sie an einem vollständigen Exemplar interessiert sind, fragen Sie bitte nach. 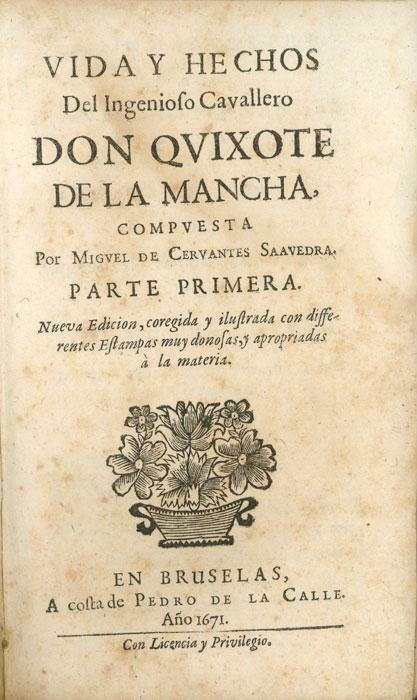 Vida y Hechos del Ingenioso Cavallero Don Quixote de la Mancha. Nueva Edicion, coregida y ilustrada con differentes Estampas muy donosas, y apropriadas a la materia. A Map of all the Earth and after the Flood it was devided among the sons of Noah. Artist: Moxon/ VisscherNicolas Joseph; issued in: London; date: 1671 - - technic: Copper print; colorit: colored; condition: Very good; size in cm : 32 x 46 - description: Decorative map of the world surrounded with pictures of biblical scenes.Numerous biblical vignettes, some with Hebrew lettering.North America is labeled with Japhet, and Eden is shown towards the cetner of the depiction of Asia. The vignettes are quite decorative. Joseph Moxon (1627 - 1691), hydrographer to Charles II, was an English printer of mathematical books and maps, a maker of globes and mathematical instruments, and mathematical lexicographer. He produced the first English language dictionary devoted to mathematics. In November 1678, he became the first tradesman to be elected as a Fellow of the Royal Society. - Vita of the artist: Joseph Moxon (1627 - 1691), hydrographer to Charles II, was an English printer of mathematical books and maps, a maker of globes and mathematical instruments, and mathematical lexicographer. He produced the first English language dictionary devoted to mathematics. In November 1678, he became the first tradesman to be elected as a Fellow of the Royal Society. Kupferstich - Karte, aus Montanus, "Tabula Magellanica qua tierrae del Fuego". 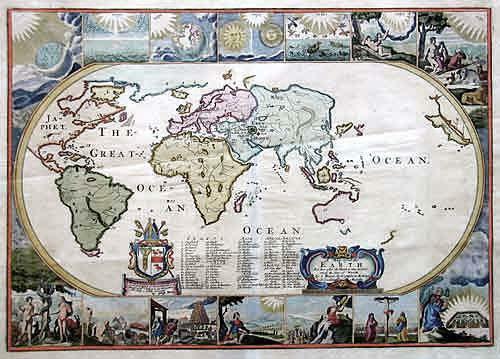 - mit Grenzkolorit, 1671, 29 x 35,5 Tooley, Mapmakers III, 272. - Mit maritimer Staffage, 2 Windrosen und 4 kolorierten Kartuschen, die Titelkartusche rechts unten. 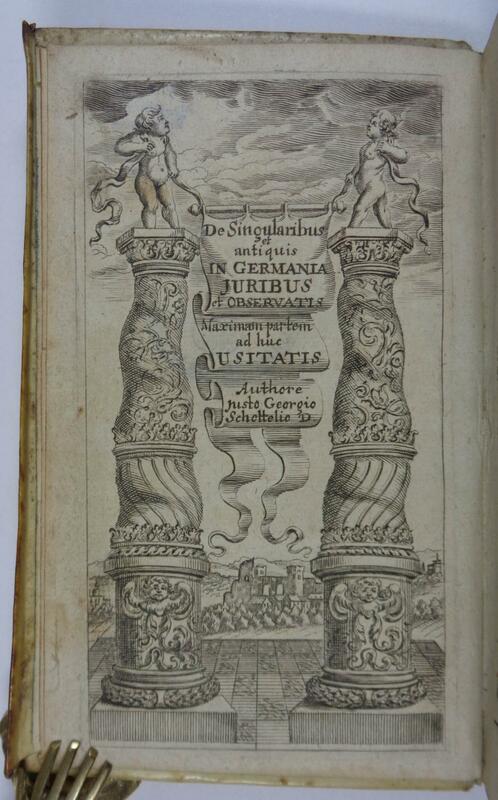 De singularibus quibusdam & antiquis in Germania juribus & observatis. Kurtzer Tractat von unterschiedlichen Rechten in Teutschland. Frankfurt und Leipzig (recte: Hannover), Grentz o. J. (nach 1686). 8°. 7 Bll., 591 S., 8 Bll., mit gest. Titel, Prgt. d. Zt. mit hs. Rückentitel. Les travaux de Mars ou la fortification nouvelle tant regulière, qu'irregulière. 3 Tle. in einem Band. Amsterdam, Janssonius van Waesberge 1672. 8°. 7 Bll., 247 S., 3 Bll. ; 7 Bll., 272 S.; 7 Bll., 272 S., mit 3 gest. Titeln u. 301 (ganzs.) Textkupfern. Prgt. d. Zt. - Pohler III, 697 - vgl. Graesse IV, 354 u. Jähns 1344: "Das Werk ist eines der ausgezeichnetsten, welche in dieser Art veröffentlicht wurden. "- Holländischer Nachdruck der ersten Ausgabe Paris 1671, mit den gestoch. Titeln der holländischen Ausgabe 1672, lediglich der Drucktitel zum dritten Teil ist ebenfalls 1672 datiert.- Eines der grundlegenden Werke zur Kriegskunst im 17. Jhdt.Der erste Teil beschäftigt sich mit der Befestigung regelmäßiger und unregelmäßiger Plätze, der zweite Teil mit dem Bau der Fortifikationen und der dritte Teil mit Angriff und Verteidigung dieser Befestigungen.- Die Kupfer zeigen Befestigungen, Kriegsgerät, Schlachtformationen etc., tls. im Hintergrund mit kleinen Stadtansichten, darunter Amsterdam, Antwerpen, Budapest, Brest, Lissabon, Madrid, Neapel, Speyer, Venedig, Wien.- Ebd. etw. fleckig, 1 Bl. mit kl. ergänzter Fehlstelle, sonst schönes Exemplar, sauber und frisch.# One of the basic works on the art of war in the 17th century, Dutch reprint in French by Janssonius in Amsterdam, one year after the first edition of Paris 1671.- Complete with 301 full page engravings; many with plans of the fortifications and views of European cities including, among others Amsterdam, Antwerp, Budapest, Brest, Douay, Arras, Lisbon, Barcelona, La Rochelle, Landrecy, Geneva, Madrid, Naples, Speyer, Venice, Vienna.- Binding somewhat spotty, otherwise nice copy, clean and fresh. Curiöser Tractat genannt Das wieder gefundene Gesicht der sonst blinden Maulwürffe. Aus dem Lateinischen ins Deutsche übersetzet von M. M.
31 S. Späterer Umschlag. Rosenthal, BMP, 5823 Vgl. Krivatsy 11812. - Erste deutsche Ausgabe der 1671 in Altenburg bei Enoch erschienenen lateinischen Abhandlung "De visu talparum". - Interessante kleine Schrift über Maulwürfe, in dem der Pädagoge und Philosoph Thomasius (1622-1684) den Versuch unternimmt, den seit der Antike bestehenden Irrglauben der Maulwurf wäre blind oder hätte gar keine oder gar von Fell überzogene Augen zu widerlegen. Seine Argumentation ist belegt er jedoch nicht durch Untersuchungen des Tieres, sondern durch Logik: der Maulwurff ist ein solches Thier, das seine jungen lebendig gebühret, deshlaben muß er ja alle sensus haben. Denn das ist der Vernunfft gemäß, das ein soches Thier, das vollkommen ist gebohren worden, auch vollkommene Sinne haben müsse. (S. 31). Mit Besitzvermerk von Graf Joseph Ferdinand von Rheinstein und Tattenbach (1723-1802). - beim Übersetzer dürfte es sich um Marcus Molitor oder um den M(agister Johann Gottlieb) M(eister) handeln. - Seiten gebräunt, vereinzelte Flecken. Insgesamt wohlerhaltene seltene Schrift. Mappa Aestivarum Insularum, Alias Barmudas dictarum, ad Ostia Mexicani aestuary jacentium in latitudine .':. - kolorierter Kupferstich v. Arnoldus Montanus, 1671, 29,5 x 35,5 Palmer, The Printed Maps of Bermuda (in Map Collectors' Circle (No. 19), 12 (1. state). 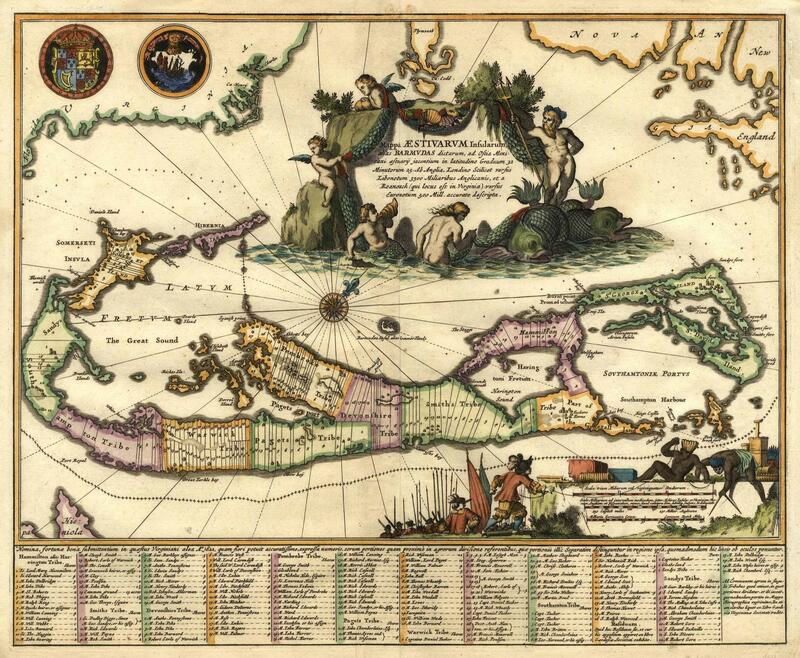 - The map was included in Montanus "Die Nieuwe en Onbekende Weereld: of Beschryving van America" and is based on Blaeu's chart of 1635. - It shows the division into the original Tribes, or shares and shows the various landowners with their names in a table below the map. - Bermuda was colonized in 1612. - The map uses Blaeu's previous projection to show Bermuda's correct proportion and position in the North Atlantic by superimposing this map over a smaller scale map of the Atlantic with the coastlines of Britain, North America (Virginia) and Hispaniola, with a tiny island of Bermuda appearing just beneath the title cartouche. - The map with a decorative cartouche including Neptune riding a pair of sea monsters, surrounded by putti. - The scale of miles cartouche shows a vignette of natives and Englishmen surveying the land, and the coats-of-arms for England and Bermuda are displayed at top left. De singularibus quibusdam & antiquis in Germania juribus & observatis. Kurtzer Tractat von unterschiedlichen Rechten in Teutschland. Kl.8. 7 Bll., 587 S., 6 Bll. Pergamentband der Zeit Dünnhaupt V, 38452, 41.2. 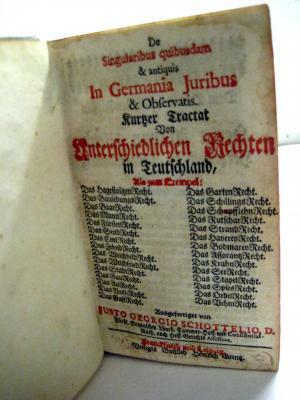 Spätere, mit der Erstausgabe kollationsgleiche Ausgabe und mit der Datierung von 1671 im Vorwort. Ein "Kompendium kurioser Rechtsaltertümer.. Eine Fundgrube zur Volkskunde u. Geschichte der Jurisprudenz". - Angebunden: Gericke, J. W. Schottelius illustratus et continuatus sive spicilegium.. Leipzig u. Wolffenbüttel, Freytag 1718. 12 Bll., 226 S., 7 Bll. - Einband etwas fleckig. Vorderer Vorsatz mit kl. Fehlstelle u. altem Nameszug. Kaum fleckig. BAÑOS DE VELASCO Y ACEVEDO, Juan. 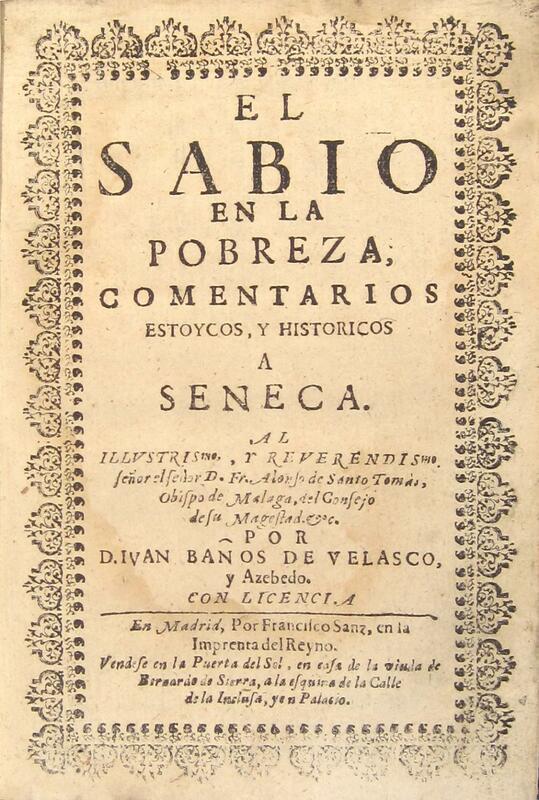 El sabio en la pobreza, comentarios estoycos, y historicos a Seneca. 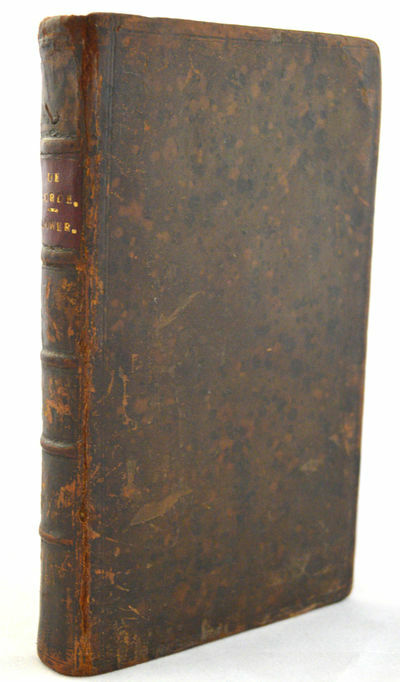 Virginiae partis australis et Floridae partis orientalis, interia centiumq, regionum, Nova Descriptio.':. - kolorierter Kupferstich v. Arnoldus Montanus, 1671, 29 x 35,5 Burden, The Mapping of North America II, 413. - 1. state. 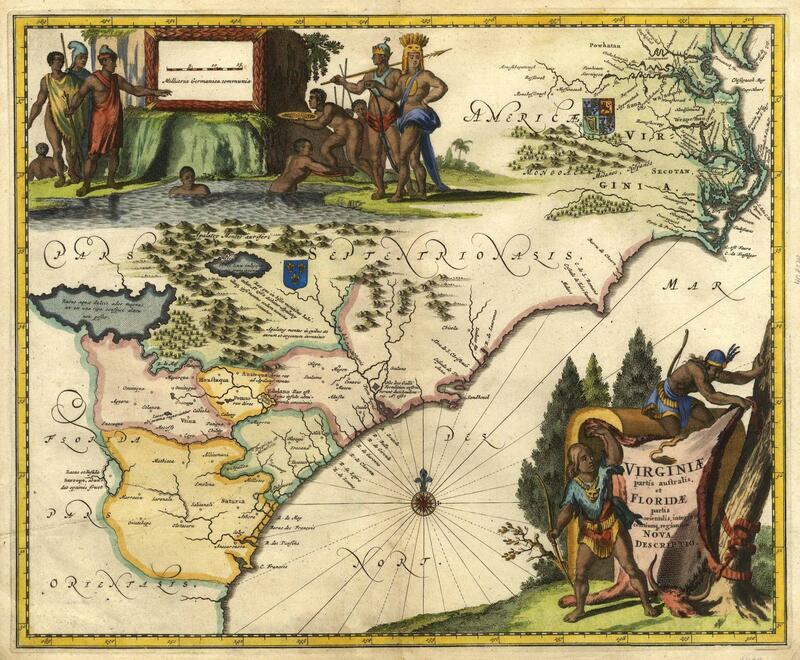 "Arnoldus Montanus drew upon the William Blaeu map pf ca. 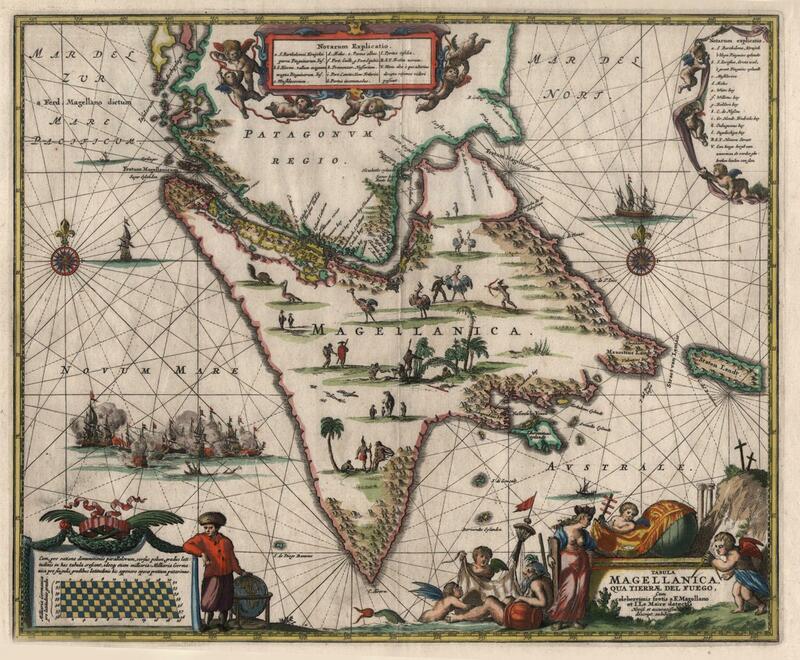 1638 for his map of this region. Already by this date it had been colonised by the Englisch and named Carolina, although no refernce is made to it here. Is is more decorative than the Blaeu in that it bears two large decorative cartouches depicting native scenes.". - Decorative map of the Carolinas. Ordo Et Methodus medicinae specialis Commentatoriae (...) cognoscendi & curandi Dolorem capitis, ad normam veterum & novorum dogmatum proposita. Guerneri Rolfincii, Phil. Et Med. Doctoris, Professoris Publici, Ordo Et Methodus medicinae specialis Commentatoriae (...) cognoscendi & curandi Dolorem capitis, ad normam veterum & novorum dogmatum proposita. Praemittitur disertatio de autoribus practicus. Jenae, Curabat Johannes Nisius. Anno MDCLXXI (1671). Werner Rolfinck, auch Guernerus Rolfincius, Rolfink (geboren 15. November 1599 in Hamburg - gestorben 06. Mai 1673 in Jena) war ein deutscher Arzt, Naturforscher und Botaniker. SEHR SELTENE AUSGABE DES GESUCHTEN WERKES. Titelblatt, 3 nn. Blätter, 245 Seiten, 11 Seiten (Register und Errata potiora), ungebunden und ohne Einband (Buchlagen lose kann daher nach belieben neu eingebunden werden), etwas gebräunt, in einem dem Alter entsprechenden dekorativen und schönen Gesamtzustand. Einblattdruck. - Van de Velde, Adriaen (del. ); A. Blotelingh (fec.). Illustrissimis & Potentissmis Hollandiae Westfrisiaeque Ordinibus, fortissimis publiae Libertatis & Salutis Defensoribus, Patriae Patribus, haec Tabula duas referens caelatorum tormentorum imagiaes. Bruxellas(Lyon). Grabador Conrad Lauwers. 1671. Tomo 2. 17x10. Pasta española. 8h+649Pág+4h(tabla). 9 Preciosos grabados. Completo. Una de las primeras ediciones del Quijote al ser del siglo XVII y Obra que se publico para conservar muy vivo en el resto de Europa la Grandíssima Obra de Cervantes. Contiene muescas en varias paginas 11Pág. N de ref. de la librería 5.4 Biblioteca A.
Gazophylacium medico-physicum. Oder: Schatz-Kammer/ Medicinisch- und Natürlicher Dinge/ In welcher Alle Medicinische Kunst-Wörter, (2) inn- und euserliche Kranckheiten nebst derselben Gene-Mitteln/ (3) alle Mineralien/Metalle... (4) zur Medicin gehörige... Thiere/ (5) Kräuter/Blumen... (6) alle rare Speceryen und Materialien und (7) viel curiöse zur Mechani gehörige Kunst-Griffe/ in einer richtigen lateinischen Alphabet-Ordnung... erklähret... werden. 4to. Mit 1 gest. Vortitel mit 9 kl. symbolischen Darstellungen. Titel in Rot u. Schwarz. 3 Bl., 1032 S. 27, 1 w. Bl. Leder der Zeit auf 5 Bünden m. dekorativer Rückenvergoldung u. RSchild. Rotschnitt. VD18 14135620. - Hirsch V,999. - In unserem Ex. die 5 Bl. Widmung an Friedrich v. Preußen nicht beigebunden. - Erste Ausgabe des unter lateinischem Alphabet geführtes Nachschlagewerkes zu allen Bereichen der Medizin samt Therapien und Rezepten, durch ein deutsches Register erschlossen. Dieses universelle Lexikon des Johann Jakob Woyt (1671-1709), Professor der Medizin und ab 1706 Professor in Königsberg, erlebte zahlreiche Folgeauflagen bis zur Mitte des 18. Jahrhunderts. - Einband etw. berieben, einzelne Wurmspuren im Einband. Vorsätze von alter Hand beschrieben. Kupfertitel etw. fleckig, Titelbl. m. Initialen, im Rande etw. knapp beschnitten. Die letzten Bl. etw. gelockert u. angerändert, stellenweise leicht fleckig oder gebräunt. Insgesamt ein gutes Ex. in einem schönen zeitgenössischen Einband. - Die Erstausgabe ist sehr selten. Drey neue curieuse Tractätgen / Von Dem Trancke Cafe, Sinesischen The, und der Chocolata: Welche nach ihren Eigenschafften / Gewächs / Fortzpflantzung, Praeparirung, Tugenden und herrlichen Nutzen/ sehr curieus beschriebenen/ Und nunmehro in die Hochteutsche Sprache übersetzt/ Von dem / Welcher sich jederzeit nennet Theae Potum Maxime Colens. 3 Bl., 247 S. (recte 245, S. 177/178 in der Paginierung übersprungen), 1 Bl. Neuerer HPgt. mit goldgeprägtem RTitel (Reste von Signaturmärkchen am Rücken) Mueller, Kaffee 68 - Mueller, Kakao 19 - Horn/Arndt 121. Das Werk erschien zuerst in frz. 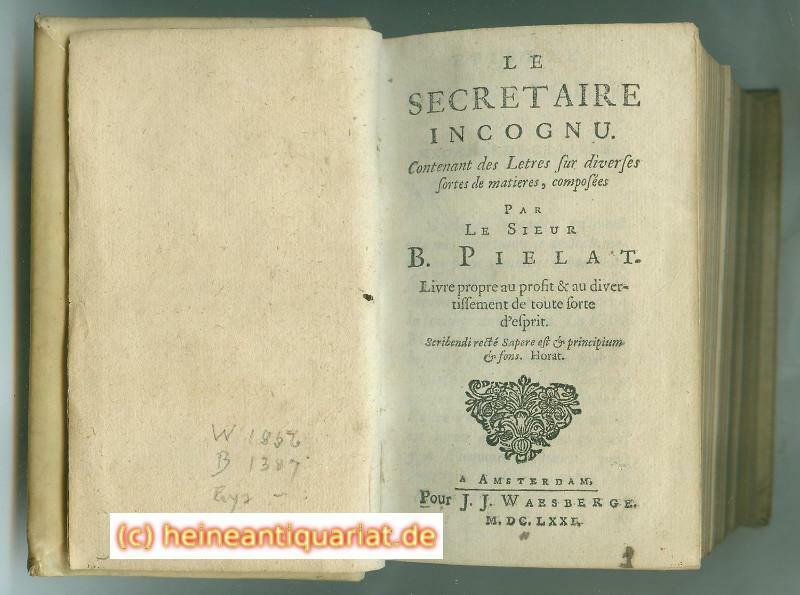 Sprache 1671 anonym erschienen De l'usage du Café... . Das Buch erschien auch in Latein sowie weiteren europäischen Sprachen. Der Autor wurde in Manosque (Südfrankreich) 1622 geboren. Er betätigte sich in Marseille als Gewürzhändler, wo er das Geschäft von seinem Onkel übernommen hatte. Als Calvinist (Protestant) musste er nach der Aufhebung des Edites von Nantes ins Exil in die Schweiz flüchten wo er auch 1687 (Vevey) starb. Das Buch wurde früher oft Jacob Spon zugeschrieben. dieser war aber der Übersetzer für die lateinische Ausgabe. Auch Spon war Calvinist, und Freund von Dufour, und floh ebenfalls in die Schweiz wo er seine Bücher in Genf herausgab. Das Buch ist mit 4 Kupfern illustriert. Das Titelkupfer zeigt den Moslem, Chinesen und Indios ihre Getrände drinkend, die 3 andern Kupfer zeigen jeweils diese Herren mit Abbildungen der jeweiligen Pflanzen. Papierbedingt etw. gebräunt, schwache Stempelspur verso Frontispiz. [Romae], 1671. Hardcover. Fair. Vols. I and II only (of 3). Latin Vulgate and Arabic translation on parallel columns on each page. Pagination of our copy of Volume I: [17 unnumbered pages (of 22 prelims, including 2 of the 4 blanks)] 331, , 466 (of 472)p. Pagination of Volume 2: [4 unnumbered pages (of 12 prelims with no blanks)], 505, , 526p. These volumes are in old unmatched leather bindings. Vol. I is wider margined and, at almost 35cm., has pages a bit more than 2cm. taller than those in Vol. II which, while still having decent margins, measures a little over 32cm. in height. The binding on Vol. I has more of a Middle Eastern look and consists of a nice piece of thick leather turned in over a couple of leaves of partially pasted down backing (one appearing to possibly be a missing preliminary leaf with "Biblia Sacra Arabica" printed on one side side and blank on the other; the other appears to be a leaf from some Arabic manuscript). The binding of Vol. I is broken between pages 256 and 257 and its contents are at least partially unstitched. Vol. I as bound lacks the title-leaf and 3 or 4 other preliminary pages, as well as last 2-6 pages (Page 466 ends in the Vulgate column with the first word of 2nd Chronicles, Chapter 36, Verse 5 so it is missing the rest of verse 5 and all of verses 6-23 of that last Chapter of 2nd Chronicles. The binding on Vol. II feels a bit more Western and is solidly bound. Modern bookseller's label on endpaper (G. A. Nabrink). Vol II also lacks its title-page and at least 3 additional leaves. These two volumes contained the entire Vulgate version of the Old Testament and its translation into Arabic. While the translation was far from perfect, it was far better than anything else when it was published. Versions of it were used as the standard Arabic Bible for about 200 years by both Catholics and Protestants until the Smith-Van Dyck edition was published in Beirut in 1865. LE MODELE DU PARFAIT CAVALIER QUI ENSEIGNE A LA NOBLESSE TOUS LES PLUS BEAUX AIRS DU MANEGES AVEC UN EXCELLENS TRAITE DE LA MANIERE DE BIEN ENTRETENIR UN CHEVAL EN BONNE SANTE ET DIVERS REMEDES EPROUVEES POUR LEURS MALADIES - DIVISE EN TROIS PARTIES. 1671. CHEZ JEAN BAPTISTE LOYSON. 1671. In-12.Carré. Relié plein cuir. Etat d'usage. Plats abîmés. Dos abîmé. Mouillures. 412 pages - coins et plats frottés - dos à 5 nerfs - titre et caissons dorés sur le dos - coiffe en pied abîmée - quelques traces de mouillures en début d'ouvrage sans conséquence sur la lecture - 2 photos disponibles. De Pileo. (Bound with:) De Toga Romana commentarivs. Amsterdam: Andries Fries, 1671. 2 parts in 1 volume. 12mo (13,2 x 7,9 cm). (10), 379, (39); 84, (12) pp. Contemporary full vellum. Illustrated with a frontispiece and 22 (of which 4 folding) plates. Index. Fine copy. On Roman, Secular, Clerical Toga's and Hats, including an engraved frontispiece by Romeyn de Hooghe. For a full description and more images please visit www.zaalbooks.nl . Samsons Leeuwen-Aes vervult met Honing. Ofte den vernederden Jesus. Arm wordende, om de sijne door sijn Armoede Rijck te maecken. Ende Godts Vaderlicke liefden herte, uytgebreydt aen sijn dedroefde Kinderen hier op aerden, daer nae suchtende. Als oock de oeffeninge van een onergerlicke Conscientie, voor Godt en de menschen. Waer noch bygevoeght wordt 't Alderkostelickste Schat, ende de Soetste Delicatessen, van een groot en wijs Koning vertoondt. Alles voorgesteldt in XLIII. Leer en Troost-rijcke Praedicatien, over verscheydende Texten der heylige Schrifture. WAARBIJ: De Kostelyckste Schat, Ende de Soetste Delicatessen, Voor de Zielen der Heyligen, na het getuygenisse van een groot Koningh ende een wijs Propheet: Aangewesen en voorgestelt Psalm CXIX. verss. 72. 103. Ende nu verder geopent, en nader toege-eygent in ses Sin en Leerrijcke Predicatien. Leeuwarden, Hero Nauta 1671. 2 werken in 1 band, (titelprent, 18) 566 (38), 132 (4) p. Origineel Perkament, 8° (Zonder schutbladen, plaatselijk wormgaatjes in de onderste marge. Zeer zeldzaam werk van de friese gereformeerde predikant Theodorus Couper, 1626-1684.). 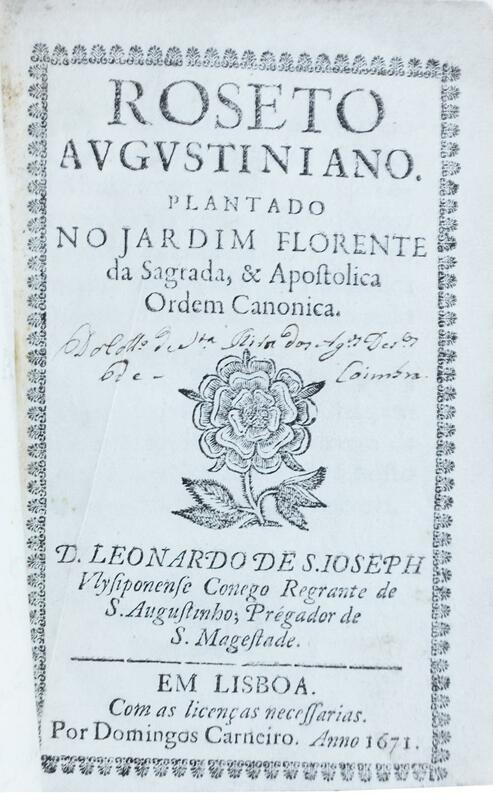 Roseto augustiniano plantado no jardim florente da sagrada, & apostolica Ordem Canonica. Imperatorum Romanorum numismata ex aere mediae et minimae formae: descripta & enarrata per Carolum Patinum Doctorem Medicum Parisiensem. Sammelband mit 29 Dissertationen und Abhandlungen des 17. Jahrhunderts (2) und 18. Jahrhunderts (27). 1 Schrift gerichtsmedizinischen Inhalts, die anderen 28 juristischen Inhalts (1 Ankündigung einer akademischen Prüfung). VAN OSTADE, Adrien (Haarlem 1610 - 1685) - "Il ciabattino". 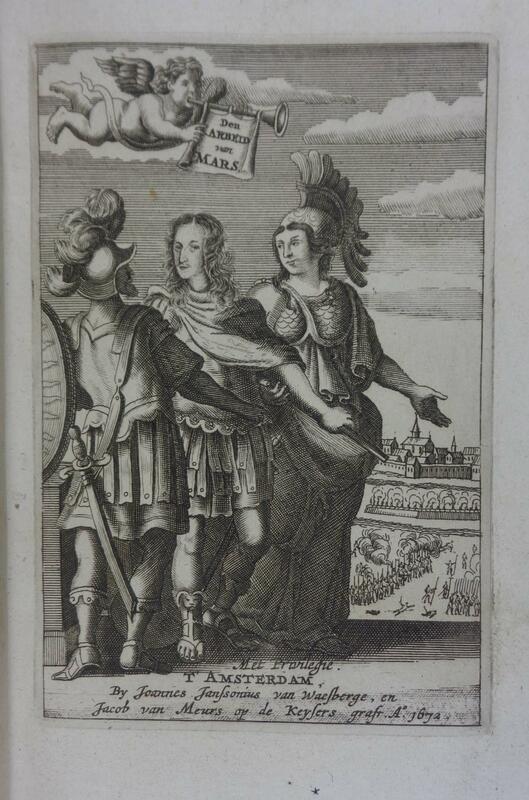 Henniges (von Treffenfeld), Joachim, brandenburgischer General (1610-1688). Eigenh. Brief mit U. ("Jochim Hennigg"). Könnigde, 12. X. 1671. 1671. 2½ SS. auf Doppelblatt mit Adresse und Siegelresten verso. 4to. An Karl Etzoldbach, Gerichtsadvokat zu Stendal: "Dessen schreiben vom 9 octob. benebenst den acten habe zu wohl erhalten, waß anbelangett der acten habe duhr gelesen, vernimmet eß so gutt genug zu sein, habe auch an etsliche orter etwaß bey gesetzett so ihm nuhn beliebet, kan es dabey gesetzett werden, gebe ihm auch hier nachricht, daß ich den 24 nach peendorf zu reisen gesinnett, die weil ich ohn dehin citieret bin, der begehrte dahler soll mit gesandt werden, wan eß abgehohlett wihrt, nach meinen gutt düncken sehe gern, daß man den soushauptmann ihr excelenz tituliret nicht allein in den achten sonder auch in der supplique [...]". Nach der Schlacht bei Fehrbellin 1675 verlieh Kurfürst Friedrich Wilhelm Henniges den Adel mit dem Namen "von Treffenfeld"; Heinrich von Kleist setzte ihm (als "Oberst Hennings") im "Prinz Friedrich von Homburg" ein literarisches Denkmal. - Papierbedingt gleichmäßig gebräunt; Faltspuren und geringe Randläsuren. Provenienz: 1931 versteigert bei Meyer und Ernst, Berlin (Kat. 18, Nr. 747). - Radierung, auf Bütten mit undeutlichem Wasserzeichen. 20,4:31 cm. 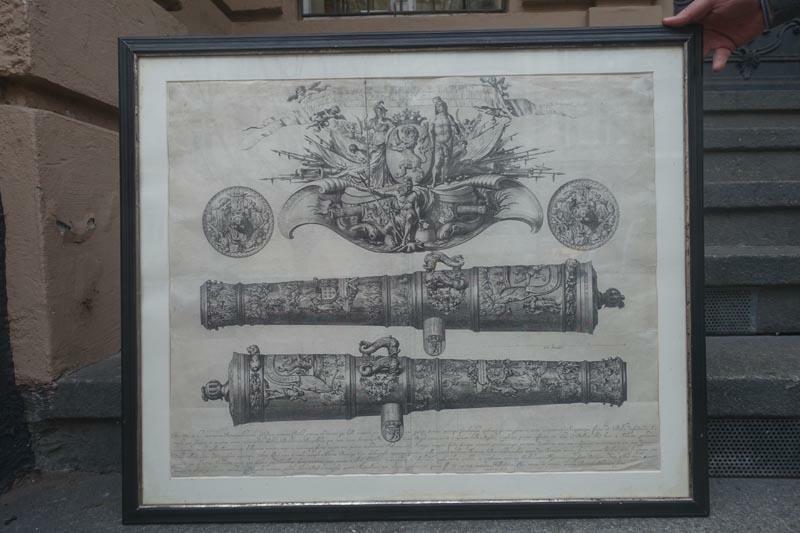 Provenienz: Sammlung Duc d&#146;Arenberg, Brüssel und Nordkirchen, Lugt 567. Literatur: Bartsch 5, I. Vorzüglicher Abdruck des 1. Zustandes, mit ca. 1,5 cm breitem Rand um die Plattenkante. Über die Ausbildung des Figuren- und Landschaftsmalers und Radierers Pieter Bout ist wenig überliefert. 1671 trat er in die Malergilde in Brüssel ein, seit 1675 etwa war er für einige Jahre in Paris tätig. Auch ein Aufenthalt in Italien wird angenommen. Er arbeitete eng mit anderen Künstlern zusammen, z.B. mit A.F. Boudewijns (1644-1712), für den er die Figurenstaffagen in dessen Bildern malte. Auch gab es eine Zusammenarbeit mit J. d'Artois (1613-1686) u.a. Signierte Werk von ihm besitzen Museen in Amsterdam, Antwerpen, Augsburg, Frankfurt am Main, Oldenburg, Pommersfelden, Prag, Rotterdam und Wien. Amsterdam N. Visscher. 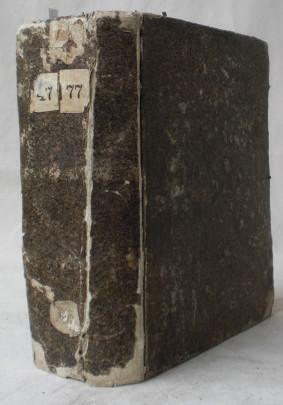 1671 and 1668 Quarto 12 1/2 x 8 1/2 inches. Full period vellum, upper board slightly cracked but holding. 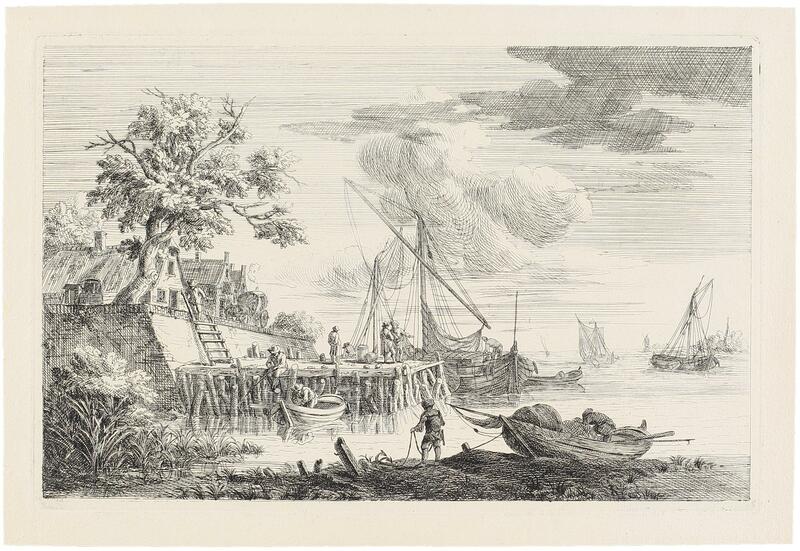 First work - engraved title by Gerard de Lairesse and 57 engraved plates. Second work - engraved title and 100 plates. Thus 2 engraved titles and 157 FINE ENGRAVED PLATES COMPLETE. Occasional marginal ink spots and one plate browned but a basically a reasonable or good copy. The plates were made after drawings by Carracci, Cigoli, Domenichino, Salviati, Arpinas, Michelangelo, and after the antique. - Some of the classical sculptures reproduced in Icones were from the 17th-century collections of G. Uylenburgh and H. Scholten. The sequence of the Icones adhered strictly to the classical tradition : first the individual parts of the body were illustrated (this section was left unfinished at de Bisschop's premature death), then complete figures, followed by poses and suggestions for compositions with more than one figure. The prints were intended to provide artists with examples of ideal poses. From the paintings of A. van der Werrff and N. Verkolje, it is clear just how influential these studies were in the development of Dutch classical painting during the late 17th century. (Ger Luijten) Jan de Bisschop, also known as Johannes Episcopius (1628-1671), was a lawyer, who became a Dutch Golden Age painter and engraver. Opera omnia collecta in unum ex libris tum editis, tum mss. Cura & studio unius è S. Mauri Congregatio Monachi Benedictini. Paris, Billaine, 1671. 1671. 4to. (16), 473, (11), (4), 232 (but: 230), (14) pp. Woodcut printer's device on t. p. Contemp. 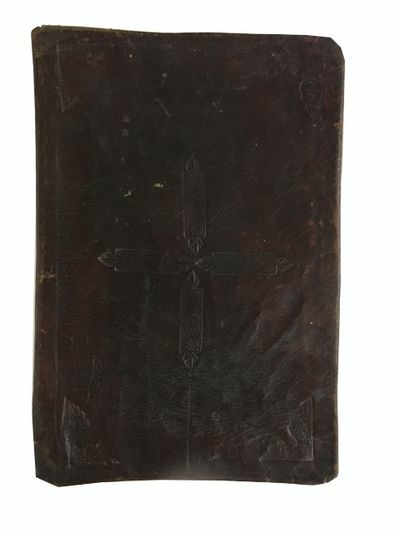 blindstamped pigskin with label to spine and blindstamped arms of the Discalced Augustians. 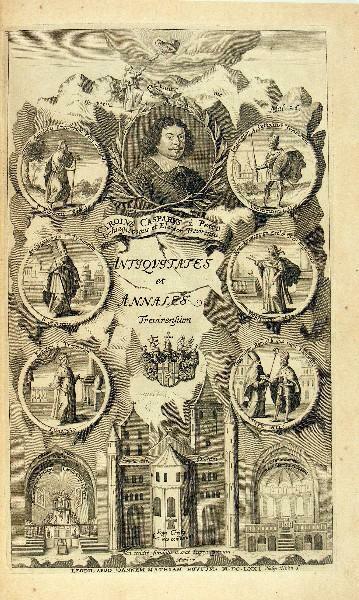 Fine Maurine edition (the first complete one) by René-Ambroise Janvier (1613-82), on which that of Migne is based. 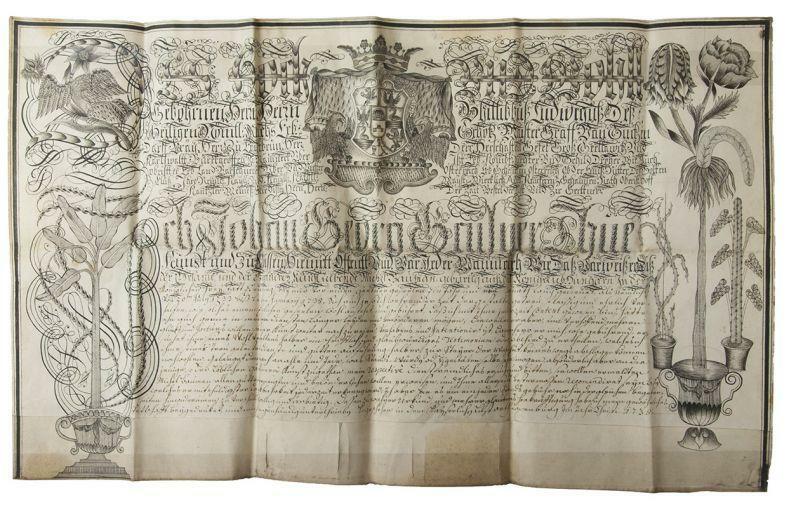 -From the library of the Vienna Discalced Augustinians with their ms. ownership note (dated 1730) and shelfmarks. Browned unevenly; one slight edge defect (loss of a thumb index). 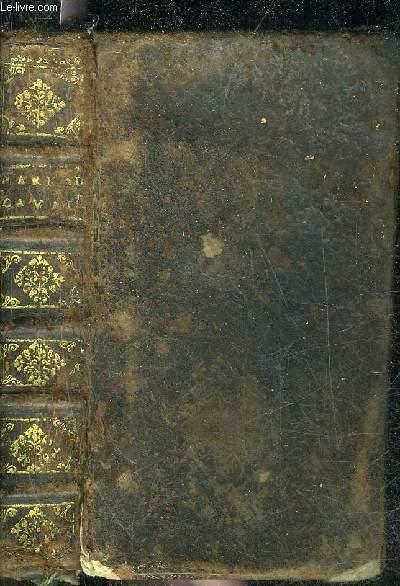 Fine monastic binding insignificantly rubbed; covers slightly warped. Wetzer/Welte IX, 1898. Hoefer XXVI, 363. Not in Goldsmith. Pratique de chymie, divisée en quatre parties, par S. Matte La Faveur, distillateur & demonstrateur ordinaire de la chymie en la faculté de Medecine de Montpelier. Avec un avis sur les eaux minerales. , Amsterdam, Daniel Elsevier 1671, petit in-12, basane brune, dos à nerfs, roulette sur les coupes, tr. jaspées, lettrines et culs-de-lampe, (épidermures, accidents aux coiffes, coupes ouvertes, coins émoussés avec manques, gardes décollées et défraîchies, mouillures claires), (6 f.) - 156p. Amstelodami [Amsterdam]: Danielem Elsevirium, 1671 A very good copy of the '3rd and Final' edition of Richard Lower's major treatise on the working of the heart and lungs. Richard Lower (1631-1691) was the first person to perform a blood transfusion, reporting in 1666 that blood had been successfully transferred between 2 dogs. Shortly afterwards he carried out an experiment to transfuse some blood from a sheep to a man - with some hopes that the gentleness of the lamb would be carried in the blood. He counted Thomas Willis (founder of the Royal Society) and Robert Hooke as close associates and was a follower of William Harvey. Tractatus de Corde (roughly translated as Treatment of the Heart) was his most important work, detailing his experimental surgery and findings. 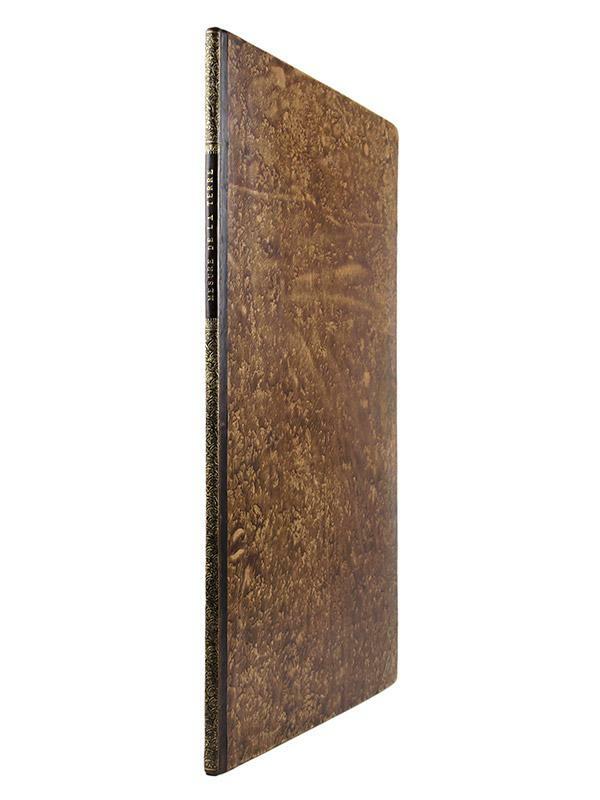 This copy, in contemporary full leather binding, formed part of the Selbourne Library - acquired by the late Hugh Selbourne - and has the Selbourne Library stamp to the verso of the title page, and the bottom margin of p 51. 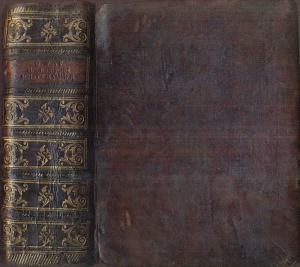 The binding, with raised bands and title label is worn (particularly at the joints and edges) but sound. Page edges lightly marbled. Internally, there is a signature of Charles Singer to the fep and the remains of some pencil notes. 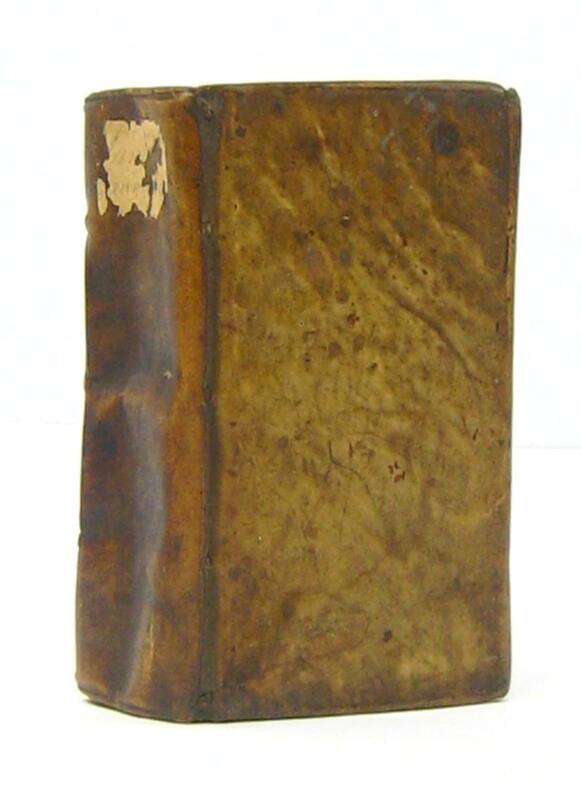 Contents: 2 blanks; title page with Selbourne stamp to verso; dedication 8pp; List of Chapters 6pp; text (with decorative headpiece and initial capital on p1) 237 pp; finis; blank; 6 folding plates; 2 final blanks. The contents are in very good clean condition. The plates would benefit from being refolded, but, apart from a little offsetting, are in very good clean condition.